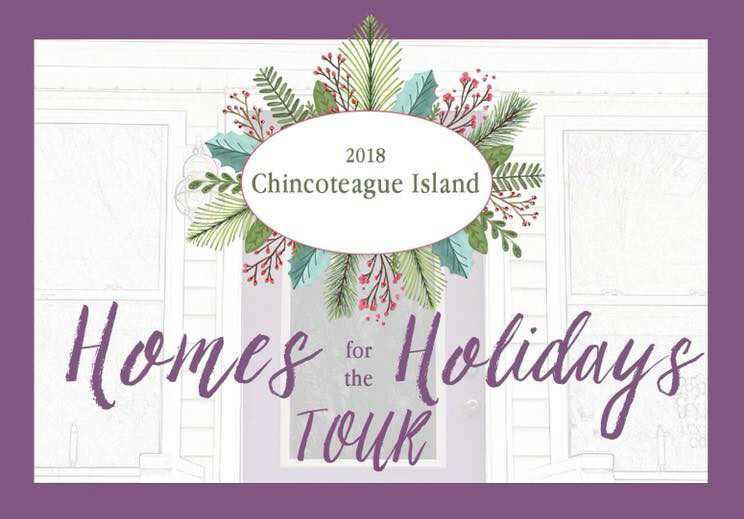 Get a look inside some of the island’s most intriguing homes during the annual Chincoteague holiday home tour event, “Homes for the Holidays!” December 1st, 2018. Come out to Virginia’s eastern shore this December and enjoy a Chincoteague holiday getaway! There’s always something doing on the island and this is doubly true during the end of the year holidays. Thanksgiving, Hanukkah, Christmas, and New Years bring their own brand of cheer and we love to share it. One of the more popular events this time of year is the “Homes for the Holidays” Chincoteague holiday home tours. Chincoteague Island has a lot of unique, historic, and beautiful homes. During the holidays, these already beautiful homes are further enhanced by fantastic seasonal decorations. Cruising local neighborhoods for their spectacular lights and decorations is a common holiday pastime around the country. Chincoteague ups the ante with the “Homes for the Holidays” home tours. Chincoteague Island’s diverse and eclectic community has a number of houses and businesses with unique architectural styles, historic pedigrees, or striking landscapes. During the “Homes for the Holidays” tour, you’ll have the chance to inspect them up close. Come see inside some of Chincoteague’s most remarkable homes and get decorating ideas for your own! “Homes for the Holidays” Chincoteague holiday home tours are scheduled for December 1st, between 11am and 4pm. If you’d like to attend, contact Kim Dennis at 703-599-4430, or kimberly.dennis@msn.com. Chincoteague holiday home tours aren’t the only thing happening on December 1st. It’s also the day of Chincoteague’s annual Old-Fashioned Christmas Parade. How old-fashioned is our parade? It’s so old-fashioned, we use the word “Christmas” instead of “holiday.” Huzzah! The Old Fashioned Christmas Parade includes marching bands, floats, antique cars, and fire companies from around the Virginia shore. Chincoteague’s own Saltwater Cowboys will be on hand, along with Santa, and the return of King Neptune and his Mermaid Queen. Come join in the fun! 7pm, December 1st, 2018 on Main Street. Festivities begin with a concert by The Salt Marsh Ramblers at 6pm in Robert N. Reed Downtown Park. No matter what time of the year you visit Chincoteague Island, Miss Molly’s Inn is here for you! Our historic, Chincoteague Island B&B offers luxurious rooms, daily gourmet breakfasts, concierge services, and much, much more. Book your stay today – and Happy holidays!